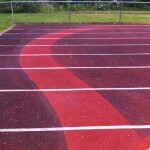 Nagle Athletic Surfaces utilizes state-of-the-art washing equipment in its surface pressure washing operation. Heated high pressure water is used to remove debris, stains, stubborn mold and mildew. This is done without chemicals, just plain old water. 98% of the water is reclaimed eliminating most runoff. When the job is complete the used water is filtered to remove contaminants collected during cleaning process, making it cleaner than rain. 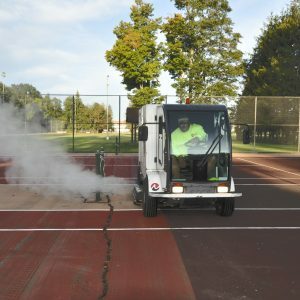 Watch this clip as our crew breathes new life into a tennis court covered with year’s of grime and mold. 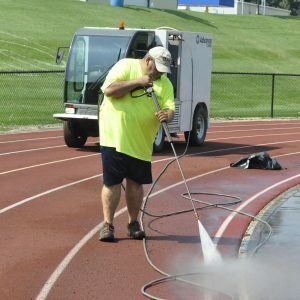 Preserve your athletic surfaces by pressure washing away debris that can abrade and damage your running track or game court. Removing stubborn mold and mildew reduces the risk of injury from slips and falls. 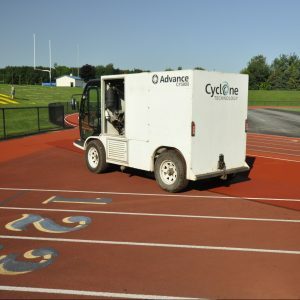 Our machines will have your surface looking good allowing you to get your facility back in the game.